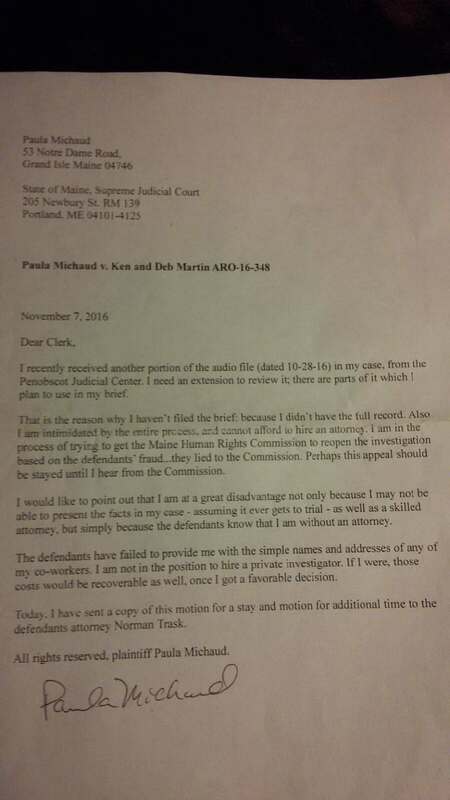 My letter to the Maine Supreme Court on 11-07-16 requesting more time to file my brief, as I had just received the audio recording of the hearings held in Superior Court. 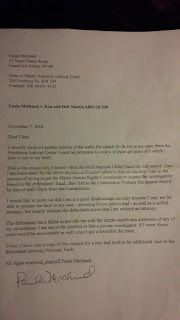 My complaint in Superior Court of Aroostook County was filed in December of 2013, right after the Maine Human Rights Commission failed to properly investigate charges I brought against my former employer (Ken and Deb Martin, former owners of the Long Lake Sporting Club). 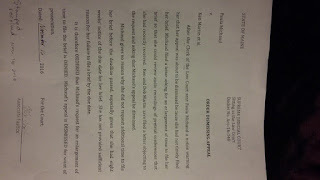 After the defendants hired a lawyer he had filed a motion to dismiss my complaint due to missed deadline. 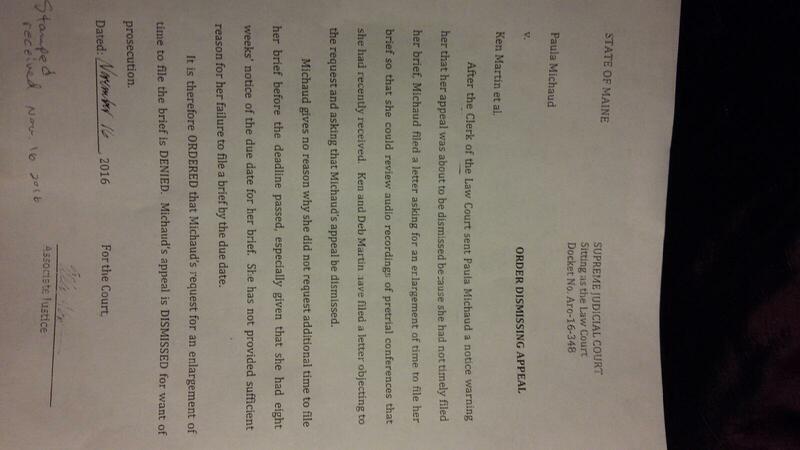 However, during a status conference, Judge Hunter had stated he would allow me the additional time. I remember specifically, I had told him that I was working at potato harvest in the months just before my complaint was due. In an order he later wrote, he dismissed other complaints I filed (such as defamation and intentional infliction of emotional distress) in an amendment to the original complaint. He said that I hadn't complied with the rules, and dismissed those claims, but stated that he'd allow me to proceed with the Whistleblower claim. Nonetheless, he instructed the clerk to schedule a hearing on the motion to dismiss anyway. So, on June 20, 2016, it was Aroostook County Superior Court Judge, Harold Stewart II who was presiding over cases. The defendants' lawyer argued the same thing he'd argued in his paperwork: missed deadline. After the hearing, I filed interrogatories and the defendants' answers with the court as well as a request for a hearing to be held regarding the discovery. The Martin's failed to provide information which was crucial to my proving that I had not received an equal share of pooled tips. I requested they provide me with the total amount of pooled tips that each of my co-workers received for the shifts they worked with me. I also requested a jury trial, and stated that the only reason I had not previously requested one is that there is a $300 fee. Within three days, Judge Hal Stewart had dismissed my complaint. A few weeks ago, I started gathering paperwork and was thinking about filing a certiorari petition to the U.S. Supreme Court. I wanted to get something in at least before deadline. The rules say you have 90 days from the date of the last state court decision (Nov. 16, 2016) to do that. The odds of getting a case heard are pretty slim...less than 1%. I really hate all the rules. You need ten copies, one for each justice plus an original for the court; and I'd make one for myself too, and the defendant, so it's really 12. Instead of working on that, I discovered another option: The Equal Employment Opportunity Commission (EEOC) might help me. I just discovered that the Maine Human Rights Commission (MHRC) never dual-filed my complaint with the EEOC, and they were supposed to. The EEOC is the federal agency that enforces employment discrimination laws. The state ones are called Fair Employment Practices Agencies, or FEPA. Either the state or the feds can investigate a complaint, and if you don't like the outcome from one, you can get a review from the other. So, I faxed them some information (10 pages total) a few days ago...basically, my complaint and the MHRC findings. Interestingly, at the MHRC website I came upon a name that I recognized: Michael Afthim. A jury awarded him over a million in damages after his boss lied about the reason for his discharge, and failed to deal with safety concerns brought to him. Now what I discovered was that prior to him filing the lawsuit, Afthim had made a complaint to the MHRC, and they had found there was reasonable grounds to believe that Mr. Afthim had been discriminated against...however, they failed to take further action. You can see his name here on page 4; it's the first one under the category Litigation. The MHRC, and other commissions, panels, committees, which are supposed to investigate complaints, and help the parties mediate, simply aren't as effective as they should or could be. The budget of the Maine Human Rights Commission is about one million dollars per year, half of which comes from the federal government... and most of it is for payroll. And guess what? They want more. See # 13. At # 8, it seems an admission that they do not dual-file with the EEOC.